A is our Army, which with impunity Bill said he’d smash at his first opportunity. B is the Base, which is called St. Nazaire, no longer the home of the gallant and fair. 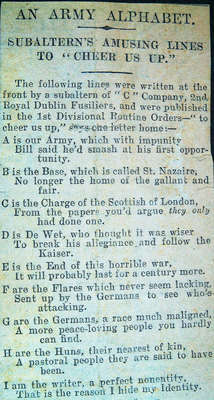 C is the Charge of the Scottish of London, from the papers, you’d argue they only had done one. E is the End of this horrible war, it will probably last for a century more. F are the Flares which never seem lacking, Sent up by the Germans to see who’s attacking. G are the Germans, a race much maligned, a more peace-loving people you hardly can find. H are the Huns, their nearest of kin, a pastoral people they are said to have been. I am the writer, a perfect nonentity, that is the reason I hide my Identity.